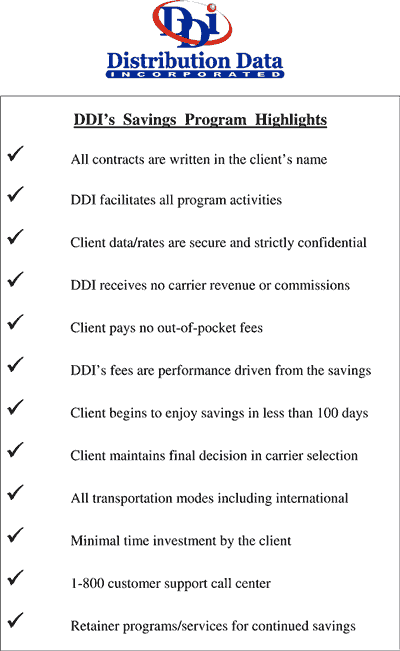 Clients do business with Distribution Data Incorporated to save money on transportation expenses. We have the resources needed to reduce costs for your company. How does your company compare? The Savings Program is a complete logistics review of your current transportation picture. Usually implemented in less than 100 days, with a minimum of time investment required on your part, clients realize average savings of 7%-15%, and often higher depending on the mixture of modes and volume. We challenge you to take our 2 hour challenge to realize your savings potential.